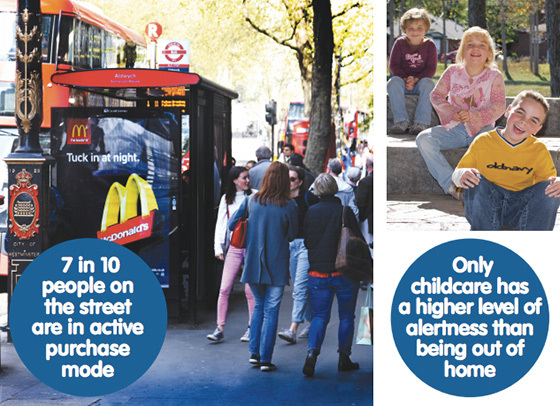 New research proves that the old claim by outdoor media industry that out-of-home environment is great for reaching consumers, as we are more alert, active and purposeful, is in fact true. We are 33% more alert, and have 28% higher propensity to take action compared to ads in other media. In early 2014 Outdoor Media Centre commissioned COG Research, working in collaboration with On Device Research and Durham University, to set about testing the theory. A combined approach of eye-tracking, skin conductance measurement, and mobile respondent surveys gave the team both qualitative and quantitative insight. COG Research has published an excellent overview of the findings on their site. While COG and Dr Amanda Ellison's team from Durham University focused on an in-depth study with 20 men and women, tracking them throughout the day and evening, On Device Research surveyed 3,600 people in-the-moment via their mobile phones across seven days, between 8 a.m. and 10 p.m. The questions ranged from location, activity, to how they felt "right now", the last ad they saw or heard and whether it prompted any follow-ups. Research with this group showed that we feel more active, switched on when we are out of home - people had 28% higher propensity to take action (look something up, buy something or talk about the ad) if exposed to an outdoor ad as opposed to ads in other media - and outdoor ads drove considerably more mobile search as well.